Wire whisk is one of the most important kitchen accessories. 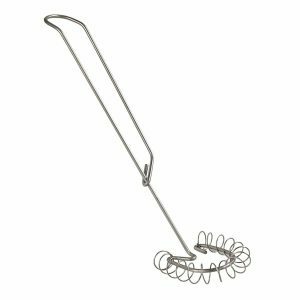 The wire whisk is a tool consists a few wires joined together to form a bowl head and a convenient handle. Over the years, all kinds of items have made their way into the market. Some are made from stainless steel, others from silicone; some come with a metallic handle while others with a rubber or plastic type. When shopping for a wire whisk, focusing on the following things, you are more certain to choose the best. Durability: the best wire whisks are resistant to high heat, extreme cold, and will serve you for many years. This applies to both the head as well as the handle. If you regularly beat eggs, whip creams, work with melted chocolate, or stir smoothies or juices, you need a versatile whisk. CHICCHIC has made life easier by offering three different types in this set. It comes in 3 pieces with different sizes. The largest measures 12″, the medium is 10″, while the smallest is 8″. They are made from stainless steel and come in balloon shape head. What makes this set a crowd puller are their nonstick nature, rustproof, nice looks, and easy to use. Starting us off is this 10-inch wire whisk from Scandicrafts. Made from stainless steel, this piece is very soft and light on the hand. It is ideal for whipping eggs, cream, and preparing a light batter. The unique head (coiled) design makes it more effective even for use with curved bowls whereas the long handle provides good and firm grip. It gets the thumb up for quality construction, lightweight, rustproof, and comfortable handle. The wire whisk is available only for hand wash. 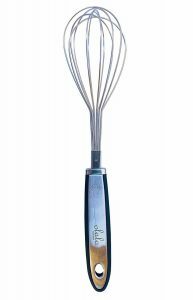 The E4U wire whisk will make you forget the hassle of mixing, beating and whipping batter or eggs in the kitchen. Constructed from high-grade stainless steel and FDA Food Grade Silicone, they come with a good design and will make frothing milk, beating eggs, making pastry batter seem like child play. It also comes with a good handle that provides good grip while the silicone whisk protects from scratching the pots and pans and also easy to wash. The stainless steel handle together with silicone is heat-resistant and 100% dishwasher safe. 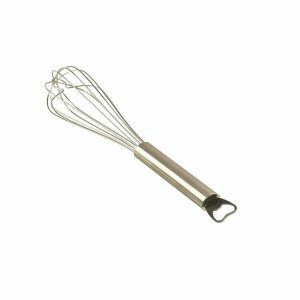 While it is easy to use, requires minimal effort, and nice looking, the E4U whisk is a bit somewhat flimsy and may not suitable enough for commercial use. 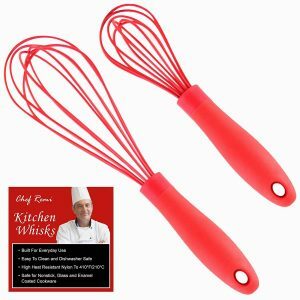 The Chef Craft premium whisk is made from high-grade and FDA approved silicone. This gives it strength and also makes it nonstick as the same time. 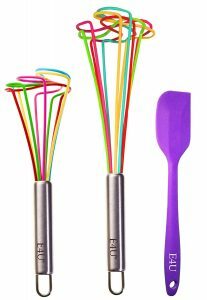 The colorful wire whisk comes with a slender head that can fit in most mixing bowls. The premium silicone accessory is heat-resistant up to 400° F, resistant to stains, and dishwasher safe. Consumers love it for its soft feel, nonstick nature, nice look, and firm grip handle. It is not best used for commercial use. Just as hinted by the name, the “Maestro” whisk will make you feel like a master. The 14″ long whisk is not only a whisk, but also a bottle opener. The 2-in-1 wire whisk is made from the stainless steel, it’s been designed for day to day use either for domestic or commercial use. The study handle is constructed from a solid and smooth stainless steel that can open the bottle effortlessly. The dishwasher safe wire whisk is also specially designed for space saving with its study hanging loop. 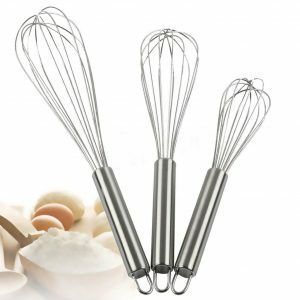 Consisting of 3 differently sized silicone wire whisks, the Wired Whisk silicone whisk set will make life in the kitchen easier. The longest measures 12 inches and is suited for heavier and thicker batter and mixes, the medium size is 10 inches long and is suitable for lighter duties, while the smallest measures 8.5 inches long and will beat a few eggs, whip small amounts or cream, or prepare small volumes of pastry batter. They all come with a nonstick FDA-grade silicone head allow the whisks can withstand high temperatures. Reasons that make this whisk worth investing in include; great colors, solid feel, good design, and firm grip. The non-stick silicone gives a very easy cleaning effect. 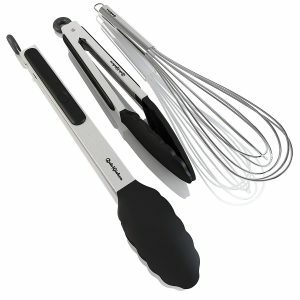 The Chef Remi set consist of an 8 and 11-inch silicone wire whisks. It is ideal for the home, restaurant, and catering service. The large one is ideal for mashing, blending, and stirring thicker batter. while the small one is suitable for beating egg yolks, whipping cream, frothing milk, whipping smoothies or juice. They are well built, sturdy, are dishwasher safe, and ensure for hygienic use. Both whisks feature silicone made handle helps prevent from slipping and the innovative teardrop handle is designed for strength and convenience. This 11″ long balloon whisk from OXO Good Grips is suitable for small to medium size container. Like other top types, it’s made from rust resistant, corrosion proof, and premium stainless steel. It comes with a convenient teardrop shaped handle that provides a soft feels in the hand while using for a long time period and also offers a firm grip even in the wet condition. The well-spaced wires, smooth and ergonomic handle are the main features of the whisk. The GuteKuchen stainless steel whisk is useful for beating, whisking, stirring, and blending food items. Made from 430 stainless steel (FDA approved material), this accessory feels extremely strong and solid, which is very suitable for heavy duty use. It is also rustproof, corrosion resistant, and doesn’t fade or tarnish. The item is suitable for small and medium size portions and can be washed by hand or a dishwasher. Good quality, easy to use, nonstick, and great looks are the key reasons people choose the GuteKuchen whisk. Beating eggs, whipping creams, making pastry batter, adding ingredients to juices and smoothies will be easier with the Olala-bakery wire whisk. Made of high-quality stainless steel, the wire whisk provides a smooth consistency and is unlikely to bend or break during use. It doesn’t rust, flake, or lose its elegance even after many years of use. And to complement the good service and reliability, it features a firm grip non-slip handle made from the soft-touch plastic. It can be washed by hand as well as the dishwasher. It receives the nod for being super easy to use, nice and firm grip, and the light weight design. All of the above items emerged top for several reasons. One, they are well-constructed and should last for a long time. Two, the materials are sturdy, won’t bend, or wobble or rust/corrode. Three, they have good ergonomics, a light of the hand, and feel soft on the skin. Their reliability is evident from the positive reviews and five-star ratings. Choose the best, for the best experience.